Click here for a copy of the Penalty Provisions of the Pressure Irrigation Water Service Ordinance. 1. A written notice shall be sent for the first violation. Notice is deemed sufficient if left with a resident over age fourteen or with a business occupant of the premises, or if left on the front door of the premises. 2. A second violation by a residential user within the same calendar year shall subject the user to a $100 penalty and the valve shall be turned off and tagged. The valve may not be turned back on until the fee is paid. Notice of the penalty shall be provided as outlined in subsection (1) and added to the City Utility Bill for the premises. 3. A third violation within the same calendar year shall subject the user to a $750 penalty and the pressure irrigation service shall be metered and a metered rate paid for the water used. Once a meter is installed, it will remain with the property and the owners/users causing its installation shall pay a metered rate each year thereafter. If the owner/user moves the pressure irrigation rate will revert back to the pre-violation rate. Notice of the penalty shall be provided as outlined in subsection (1) and added to the City Utility Bill for the premises. The person(s) violating must appear before the City Council and obtain their approval to have water restored. 4. A fourth violation will also result in the termination of the service for the remainder of the irrigation season. CLICK HERE for a Pressurized Irrigation System Connection flyer in PDF format. 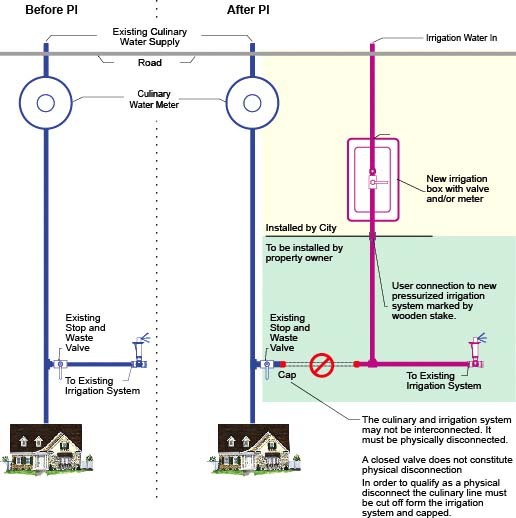 Below is a diagram that illustrates a typical residential connection to the pressurized irrigation system. It also shows a typical disconnect from the drinking water (culinary) system. It is unlawful for these two systems to be connected at the same time even with a shut off valve in-between the two systems. The two systems must be physically disconnected from one another to avoid potential contamination. Please call Salem City at 423-2770 to schedule an inspection when you connect to the PI, before you bury your piping systems.